The life, the mysterious but documented transformation to ‘light’ body and the teachings of Siddhar Sage Vallalar serves as a teachings of objectives of yoga, meditation and higher consciousness. – Alight a lamp and celebrate Source as the formless form of the flame. – Be non-violent. Do not eat meat. – Be compassionate. Receive grace. – Feed the hungry. Do dharma. – Awaken Source within to be Source. 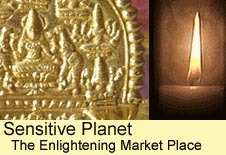 Sudha Sanmarga (Pure Gathering) teaching is mainly spread in the South India. 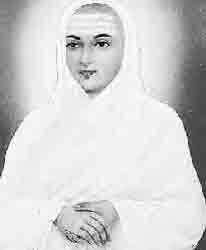 One of those, who carry significant share in the fact that Sudha Sanmarga teaching is still living, is Tamil saint Vallalar, who lived in Tamil Nadu in 19th century. Vallalar belongs to a line of Tamil saints known as “gnana siddhars” (gnana means higher wisdom). The Suddha Sanmarga was spread and passed on by him not only in theory but mainly in practice by his own way of living which was itself inspiration for his followers. According to Suddha Sanmarga, the prime aspects of human life should be love connected with charity and spritual practice leading to achievement of pure knowledge. Both of these aspects were embodied by Valallar into two buildings in small South Indian town Vadalur. The first building is called Dharumachalai. The food has been served there daily to the hungry and needy people since its opening in 1867. The service is still running thanks to voluntary donations of Vallalar’s followers upto these days. It thus serves a meaningful purpose and at the same time inspires other Vallalar´s followers to start similar activities at other places. The second building is Gnana Sabai – Hall of Wisdom. This building symbolizes the human body and it is an inspiration and signpost for those who want to practically follow Suddha Sanmarga. The second picture shows the central point of Gnana Sabai where just light is placed. Contrary to Hindu temples or Christian churches there are no statues or any other images of god or deities. While the first building, Dharumachalai, represents the fulfillment of bodily needs, then Gnana Sabai symbolizes the fulfillment of spiritual needs of a man. Both buildings together refer to the both aspects of a human being, physical and spiritual, and to their mutual relations. We have come accross Suddha Sanmarga teaching in person during our stay in Tamil Nadu in 1998. There are still some people who understood that Suddha Sanmarga is not only the philosophy but first and foremost the practice of every single moment of human life. One of such a rare persons has introduced us into Suddha Sanmarga teaching without asking for any reward. Thanks to such a people Suddha Sanmarga teaching has been preserved in original, pure and noncommercial form. The tradition of Tamil siddhars dates back to the long history of the mankind. It continues to live both in the oral tradition and in siddhars’ manuscripts written in their mother tong – Tamil. The manuscripts contain spiritual, philosophical, social or scientific essays both in prose and poetry. These essays are usually written on the palm leafs and just small part of them have been published up to now. Siddhars are well aware of the fact that spiritual knowledge can not be transmitted verbally in full breadth. That is why they do not seek to do so. Their manuscripts are first of all source of inspiration and show how to reach one´s own spiritual knowledge and experience. Siddhars use in their manuscripts rich symbolic language which enables them at the same time address both a casual listener as well as an adept of great spiritual awareness who can see a deep meaning in them. The siddhars manuscripts are a closed treasure-box locked by the lock of ignorance. The key to this treasure-box is nothing but practical following of their message in daily life. In this way the message of the siddhars is protected against misusage and deformation by the people of superficial and acquisitive motives. For those who are seriously interested in it the message remains preserved in its original, pure and noncommercialised form. Next reason, besides the language barrier, why the siddhars message remains concentrated in Tamil Nadu, is the fact that their philosophy is the contrary of the official Hindu philosophy represented in the literature of Vedas. In their manuscripts siddhars point out the absurdity of the caste system, denounce the privileged status of Brahmins and downgrade the importance of the religious rites. Due to the difficulties in understanding the symbolic texts and also because of the opposition of the caste system advocates, the vast majority of siddhars’ manuscripts has not been published yet. However, the knowledge of these manuscripts is not necessary for one’s spiritual practice. Besides the philosophical and spiritual texts the siddhars’ manuscripts contain also essays on biology, anatomy, physiology, chemistry or astronomy. The complex knowledge of these subjects is the result of the integration of spiritual and scientific approach to the cognition of the world and the human being. Through the systematic observation and the study of the nature siddhars have also developed the compact system of the medicine. The records of this system which is written on the palm leaves date to the pre-vedic period, it means before 1200 B.C. It is obvious from the siddhars’ manuscripts that their medicine system pays attention to both body and mind. Medicine is that which enables immortality.